THE GOG BLOG by RORY SPEARS, Director of Content and Creation. Follow Rory on Twitter @GogBlogGuy, Linkedin and Facebook. 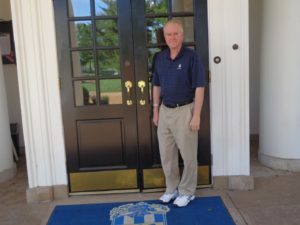 At Bellerive Country Club home of the 100th PGA Championship. I’m finally wrapping up this column. 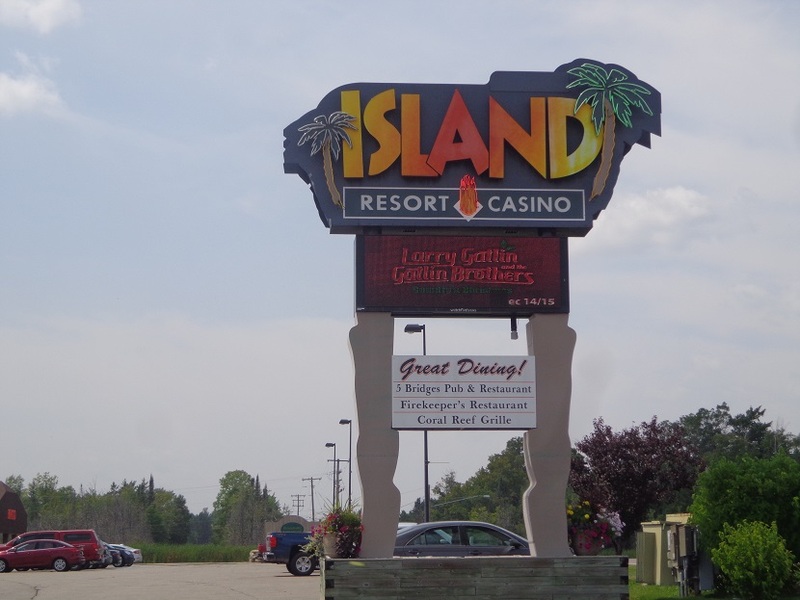 It started at Wrigley Field last Sunday night, continued at the Island Resort and Casino in Harris Michigan, and now the final touches in my hotel located in Green Bay Wisconsin after my first night at Lambeau Field. It’s been a long week. BROOKS IS THE MAN and the new face of golf, and major championship golf. What’s sad is that he is still not getting the credit he deserves for winning three of the last six major championships he has played in. He missed the Masters this year while recovering from a wrist injury, or maybe he would have won yet another major. One thing is for sure, Koepka won’t be flying under the radar anymore at majors. The post championship hoopla, is all about Tiger Woods, and the fact he snuck in for second place. Okay, remember the old adage about “nobody remembers who finished second”. Yep, lets keep it that way. Woods hasn’t won ANYTHING in years, and the silly hype about him is already getting out of control. It will be sad if golf goes down that path again. No sport is all about one player, it never will be. THE PGA now moves to May starting next year, so Koepka will only be the champion for nine months. I was never for the move that in some ways messes up the schedule fr the year, and wraps up the major in the USA, by Mid-June. It eliminates many great markets from having a PGA Championship in future. Hopefully the schedule changes at some point again and the championship can return to August. THE RYDER CUP TEAM for Paris this fall is coming together, eight players earned their way on the team. Four more will be captains picks, who should Jim Furyk pick. Will Furyk get pressured to picked Tiger by the PGA, or TV. Let’s hope not. In fact Furyk should take a pass on Phil Mickelson too. Woods has career losing record in the Ryder Cup, and the last team he played on, there was issues about who would play with him, one story said none of the other team members wanted to, and there could be some truth to that. Woods killed Team USA at Medinah with his 0-3-1 record. In fact since the 2002 Ryder Cup, the USA is 2-0 when Woods doesn’t play, and 0-5 when he does. 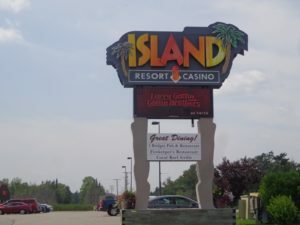 The week ahead has me heading up to the UP. 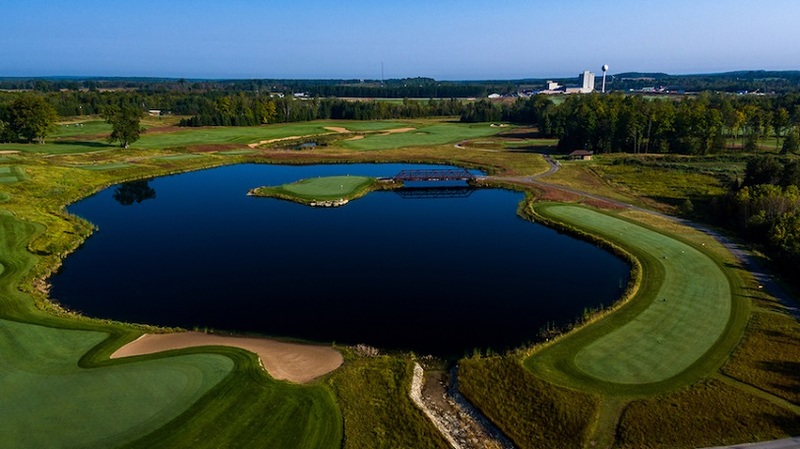 The upper Peninsula of Michigan to see the new Sage Run Golf Course by Paul Albanese, part of the Island Resort and Casino. I’ll play a few others and check-in later in the week. IF YOU MISSED our story from last Sunday. Royal Melbourne in Long Grove that is operated by KemperSports management was awarded the 117th Women’s Western Amateur by the WGA-WWGA, congrats to them. Here is hoping they have a great week for the championship. IN TODAY’S CHICAGO TRIBUNE a good read by columnist Eric Zorn on some future planning idea’s for the Jackson Park Golf Course, who could be involved and who should get tossed. THE GOG BLOG by RORY SPEARS, Director of Content and Creation, follow Rory on Twitter @GogBlogGuy. and on Linkedin and Facebook. 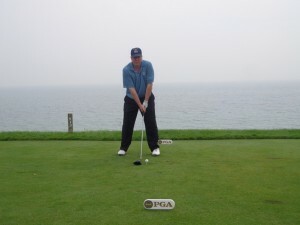 Teeing it up with the PGA at Whistling Straits. 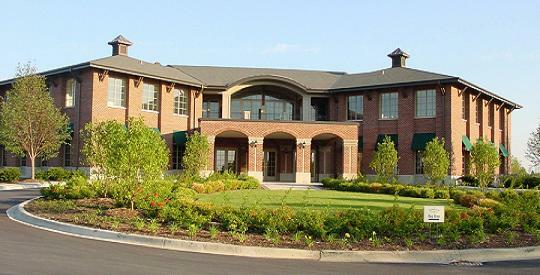 KEMPERSPORTS Management based in Northbrook, has recently announced in conjunction with the Western Golf Association and the Women’s Western Golf Association the home for the 2019 Women’s Western National Amateur Golf Championship. Royal Melbourne, designed by Greg “The Shark” and managed by KSM previously played home to the Illinois Open in 2015, won by David Cooke. Now it will host a national championship in late June of next year in 2019. The WWGA-AM has been held every year since 1901, is the longest running women’s amateur golf championship. 2019 marks the first year the Women’s Western Golf Association will run the championship in conjunction with the WGA. The view of the clubhouse from the 18th fairway. Norman worked with veteran architects Ted Robinson and Bob Spence on his first design in America, named after his favorite course in Australia, Royal Melbourne. Royal Melbourne is a mix of shorter holes around ponds, prairies and trees, and longer ones where accuracy is important. The undulating fairways create uneven lies and camouflage approach shots. KemperSports management president Josh Lesnik made the announcement at the annual KSM golf Invitational that was played at Royal Melbourne, earlier this week. The championship will have a field of 120 players whose handicap can not exceed 5.4. The championship will start with two days of 18 hole stroke play. Then the cut will be made and the lowest 32 scores will advance those players into match play. 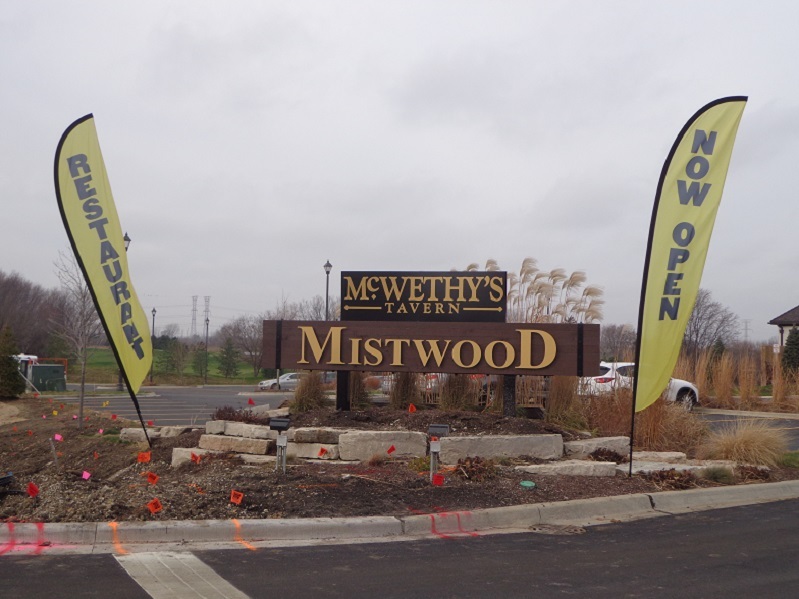 Emilee Hoffman of Folsom California, won the 2018 championship at Mistwood Golf Club in Romeoville, over University of Illinois junior to be Tristyn Nowlin. Other past winners of the championship include, Ariya Jutanugarn (2012) Stacy Lewis (2006), Brittany Lang (2003), Grace Park (1998), Christie Kerr (1995) and Nancy Lopez (1976). No site has yet been announced for the 2019 WWGA Junior Championship. For more details please visit wwga.org. 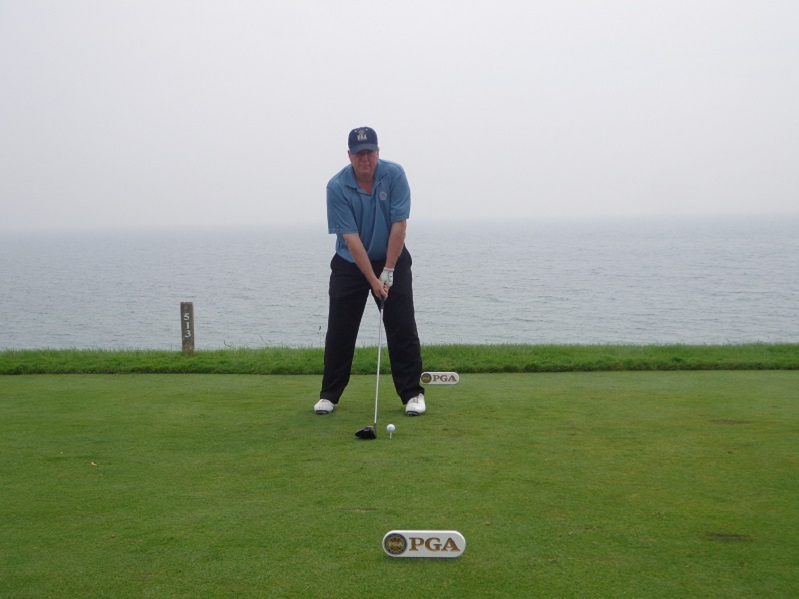 GOLFERS ON GOLF RADIO, AM 750 WNDZ CHICAGO Tee Time is 10 AM every Saturday morning through Sept. 8th this summer. 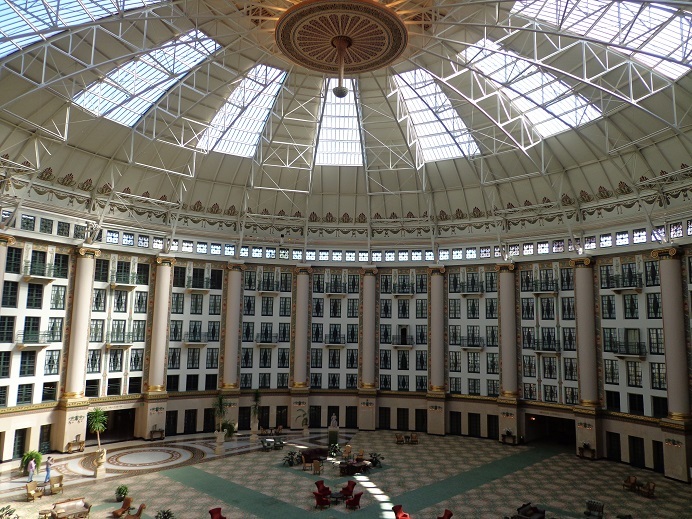 THE FRENCH LICK RESORT is the proud presenting sponsor of Golfers on Golf Radio on Am 750 WNDZ. 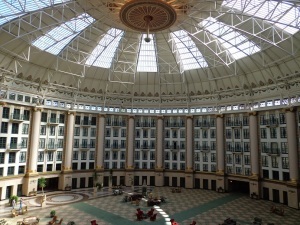 See Frenchlick.com and book your stay today. This week on the show, Ed Stevenson and Rory Spears, will update and review the happenings of the 100th PGA Championship at Bellerive Country Club, in Town and Country Missouri. (Near St. Louis). Justin Thomas is the defending champion and one of the crowd favorites, along with Rickie Fowler and Jordan Spieth who is looking for the career grand slam. 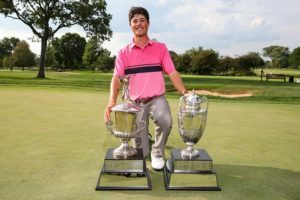 2018 Western Amateur champion Cole Hammer with the George R. Thorne champion’s trophy and the Cameron Eddy medalist trophy. Hammer was co-medalist in the stroke play qualifying and won the championship match Saturday, Aug. 4, 1 up over Davis Riley. There will be a recap of the 116th Western Amateur played at the Sunset Ridge Country Club in Northfield. Hear from champion 18 year-old Cole Hammer of Texas, on his thrilling win over Davis Riley. 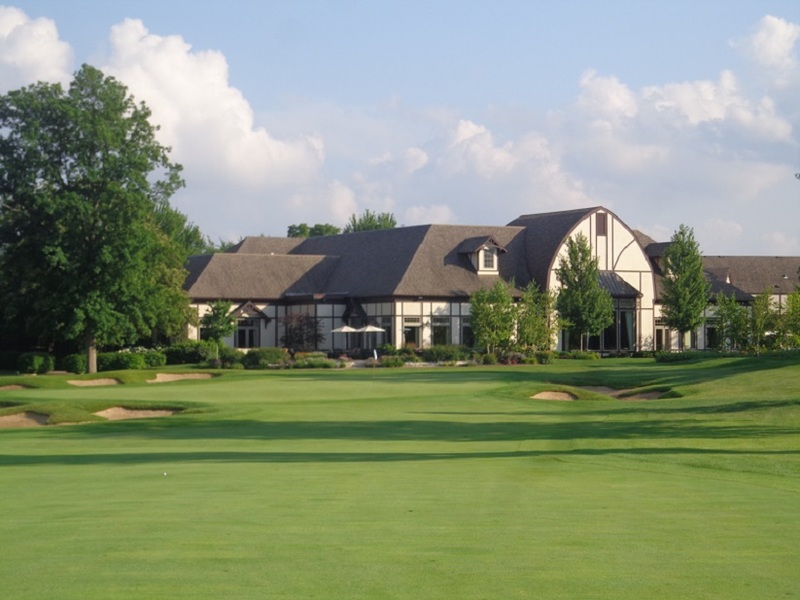 The Western Amateur will move back to the Point O’Woods golf Club in Benton Harbor Michigan in 2019, and the Crooked Stick Golf Club in Carmel Indiana in 2020, before making it’s return to the Chicago area in 2012 at the Glenview Club, where the championship was first conducted. 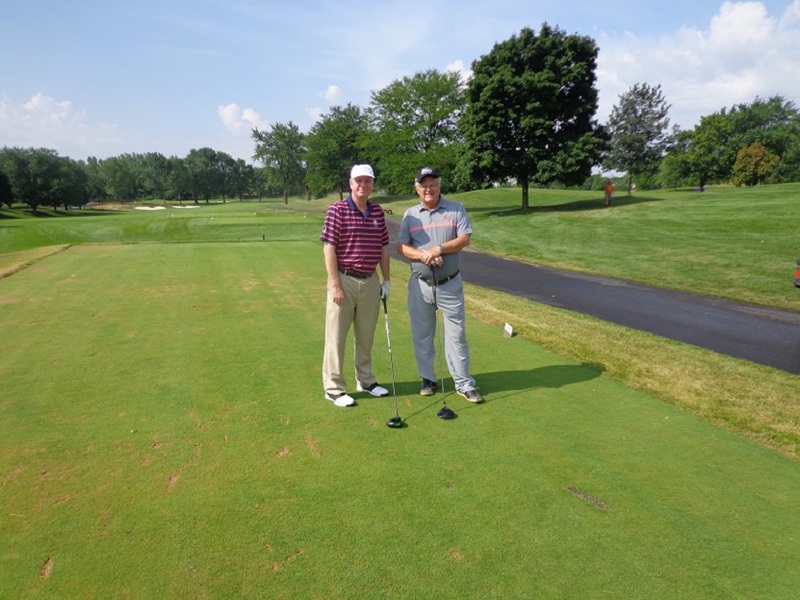 A RECAP OF THIS PAST WEEKS Illinois Open won by Vince India (R), who won his first Illinois Open by 1 shot, then boarded a plane to compete in this weeks Web.com tournament in California, where he received a sponsors exemption. Watch the PGA Championship this weekend, the final major of the year. We will hear from Tim Cronin of the Illinois Golfer live from Bellerive, and from Brett Dreier of the Illinois Junior Golf Association. TEE time is 10 Am join us. CHARITY GOLF is on the tee for the Animal House Shelter, and the Putt’s for Paw’s outing on October 1st, at the Elgin Country Club. It’s from 11 Am to 7 Pm. Cost is $250 per person or $900 for a foursome. The outing is a scramble, in a shotgun start, there is lunch dinner, raffles, prizes and a silent auction. There are sponsorship opportunities still available. THE CENTENNIAL PGA CHAMPIONSHIP from the Bellerive Country Club in Town and Country Missouri. Round 1 is complete, Rickie Fowler and Gary Woodland are leading. (REPORTING FROM BELLERIVE)… It’s day 1 of the centennial PGA Championship and Rickie Fowler got off to the hot start with a 5 under par 65. The long hitting Gary Woodland has matched that score and then added one more birdie in the afternoon, with Zach Johnson, Jason Day, Ian Poulter, Justin Rose, Dustin Johnson lurking at 3 under par three shots behind. 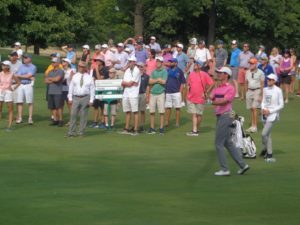 It’s easy to tell that big time golf has not been in St. Louis for years, because the galleries for this celebration of the sport have been massive during Round 1. Of course it’s a major, but the PGA of America did a great job of getting the entire city of St. Louis involved from Day 1, and it has showed. Members of the St. Louis Cardinals like Ozzie Smith, and St Louis Blues like Bernie Federko have been involved as ambassadors working the city for years to drum up sales of tickets and hospitality. Fowler the Oklahoma State alum, has long been a St. Louis Cardinal fan and that has made him the choice of the people this week. Jordan Spieth (71 +1) looking for the career Grand Slam and defending champion Justin Thomas (69 -1) the son a PGA professional are favorite numbers 2&3 this week. For Fowler it’s like having a home game this week at Bellerive. The golf course which has been a project this summer for the superintendent and his crew, seems to be in pretty good shape. High heat mixed with the some big rains, have created challenges, and forced the PGA not to cut the greens to tournament speed until last night. The collars of the greens that were Zoysia grass, that were replaced by Bermuda grass around July 5th, have received compliments from the players. The club didn’t allow play the last two months of the summer when the temperatures reached 90 degrees or more. There was temporary greens put in, that were used for events like the member guest. In fact the PGA of America paid the club members dues for July and August. With very large galleries every day this week, and the merchandise tent packed to side-to-side and front to back with check lines running as long as 25 minutes at times, the PGA should do quite well on the money side. Gallery sizes were estimated to be between 35,000 and 40,000 patrons for Thursday’s opening round. While the practice Rounds for the first three days drew large galleries as well. The interesting story that has appeared online is that hackers broke into the PGA’s network servers, and have locked them out of certain area’s of information needed for the championship. They are demanding a ransom to unlock the servers, no word on how that is working out so far. The course record at Bellerive that is playing at a par of 70 and yardage of 7,335 is a 62 by Jim Furyk in the 2008 BMW Championship. Woodland had a chance for 63, but his birdie putt from 20 feet on the 18th green came up just short of the hole. THE GOG BLOG by RORY SPEARS, Director of Content and Creation. Follow Rory on Twitter @GogBlogGuy and on Linkedin and Facebook. At the front door of Bellerive Country Club home of this weeks Centennial PGA Championship. WHEN THE RAIN finally stopped and the good weather arrived, the field at the 69th Illinois Open Championship started making birdies. When it was over Vince India had made a few more of them than anyone else and won his first Illinois Open title. India’s final round of 6 under par 66 at The Glen Club was just enough to avoid a playoff with Brandon Holtz who finished second for the second straight year in a row. India ended up 14 under par, with Holtz at 13. With this years purse of $98,645 the winners check turned out to be a total of $19,004, due to amateurs making the cut who do not get a check. Holtz the runner-up made $13,063. 2018 Illinois Open Champion Vince India with the trophy. India who has battled disc issues in his back this year, has played in seven Web.com tour events and made only two cuts. His total on the money list for 2018, was much lower than he made with the winners check at the Illinois Open. India had to think strongly about his schedule when he got a last minute sponsors exemption into a tournament in California, and had only 90 minutes to get to O’hare from the Glen Club after the trophy ceremony to make his flight to San Francisco. India admitted he would have a couple of Bloody-Mary’s on the plane, and start watching a movie before likely passing out. His tee time in the morning is 9:05 local PST. For Holtz his late rally came up short, and admitted to a bad shot on the par 3, 17th hole that ended up a bogey. As a result he needed eagle on 18 for a playoff, and almost made it but his putt just missed. For India a playoff was something he could not afford to have. 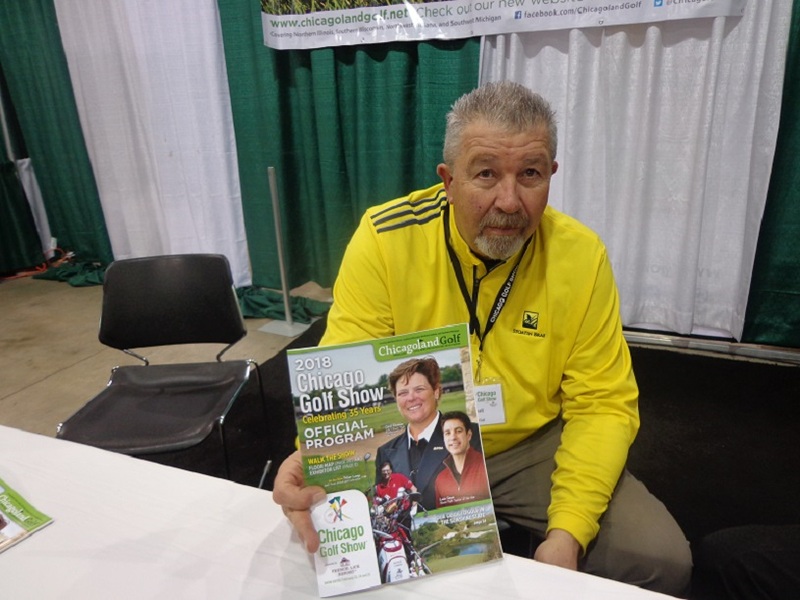 Holtz who still works in the sporting goods industry, selling football helmets and other goods, the Illinois Open was his third tournament of the year. He says after back-to-back runner ups, he will return in 2019. The shot of the day was hit by Jeff Kellen from Machesney Park that is located near Rockford. Kellen’s first shot of the day was on the par 3, 17th hole. A hole he didn’t want to start on, but in the end he decided he would take the ace when his tee shot found the cup. While media types were scratching their head as to made the last ace in the Illinois Open, it was Kellen who provided the answer. “The guy in the group behind me yesterday in Round 2 made one on the 9th hole,” said Kellen. 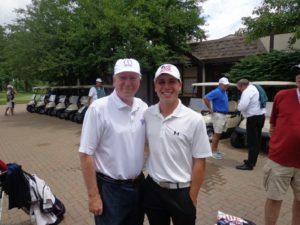 That guy turned out to be 2018 IPGA Match Play Champion Garrett Chaussard the teaching pro at Skokie Country Club. Chaussard used a 3 wood from 226, to record his hole-in-one. David Perkins of East Peoria ended up as low amateur beating out playing partner Brendan O’Reilly from Hinsdale. Defending champion Patrick Flavin made the cut and rolled in a couple of birdies in his final round, to make his first professional check of $1,045 Flavin said he played well, but didn’t make enough putts. he will now prepare for the web.com tour school that starts at the end of the month. 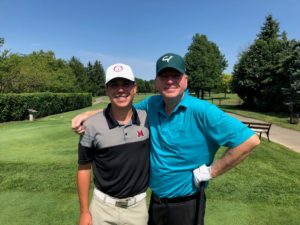 Flavins former teammate in college at Miami of Ohio, (a) Brian Ohr of Wheeling who made the cut and finished under par, gets 1 day off before heading to his third straight U.S. Amateur at Pebble Peach where he has never played before. Ohr feels he can make the match play this year. Four time champion Mike Small the university of Illinois golf coach closed with a three under par 69, to finish 8 shots behind India. Small admitted he is ready for a short break after a lot of golf in recent weeks. But says will be ready for the IPGA Section Championship at Stonewall Orchard in 3 weeks, a tournament he has won 12 times. There was no announcement on next years second course, but the first course will again be the Glen Club. THE 69TH ILLINOIS OPEN IS UNDERWAY with final round play tomorrow at the Glen Club, with a later start due to delays from Tuesdays rain storms that hampered the area. The Gog Blog by Rory Spears, Director of Content and Creation. Follow Rory on Twitter @GogBlogGuy, and on Facebook and Linkedin. 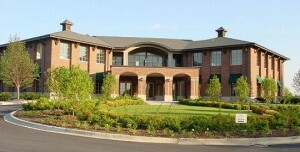 At the front door of the Bellerive Country Club home of this weeks Centennial PGA Championship. UPDATED Wednesday morning. Second round play is still wrapping up, but it has allowed Vince India with a 64, and (A) David Perkins with a 66 to join early second round leaders who finished play on Tuesday Daniel Hudson, Andy Mickelson and Brian Bullington at the top of the leader board at 8 under par. 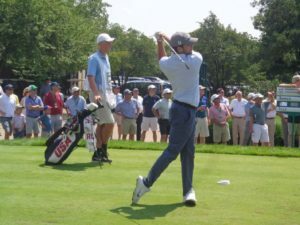 Things were sailing along in Round 2 of the Illinois Open on Tuesday afternoon, Round 1 had finished early Tuesday morning, but as a result of wrapping the first round, the final tee times for Round 2 were pushed back to 3:20 in the afternoon. That would still have allowed the round to be completed before darkness, but in the 2 o’clock hour the rain the started falling again. By 3 pm the rain fall was getting stronger and the horn was sounded to stop play at 3:08. That horn blast came just minutes too late for leader Daniel Hudson who qualified for the Illinois Open just last week at the last qualifier that was held. 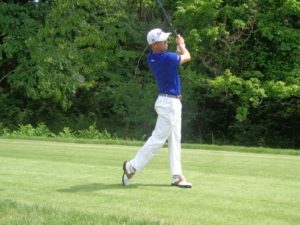 Hudson of Western Springs, who played college golf at Kansas, and has been playing in Canada on the Mackenzie Tour had a three shot lead as he headed to the 18th tee at Ravina Green. The par 5 18th hole, that has a fairway about as wide as a bowling alley is a tough tee shot. Hudson lost his tee ball int he trees, and had to go back and hit a provisional ball, then as jumped in his cart and started up the fairway, the horn blasted stopping play. Hudson like the rest of the field that was still on the golf course, then got to wait for almost four hours to play their next shot. Hudson only blamed himself for the bad tee shot on 18, that lead to a triple-bogey 8. The three shot loss put him back into a tie with Mickelson and Bullington. Click here to hear the interview with second round co-leader Daniel Hudson. There was much discussion among tournament officials about whether to restart play or wait until Wednesday morning. But when the sun appeared late in the 5 PM, hour the decision was made to get as much golf in as possible until darkness. As a result of the extra 75 minutes of golf, several group at both courses did finish and the players avoided having to comeback out early on Wednesday. With 19 players within four shots of the lead headed into the final round, and greens at the Glen Club softened from the heavy rains, the Illinois Open could turn into a shootout for the title. Right behind the leaders are Dakun Chang and Kyle Kochevar just 1 shot back, past champion David Cooke of Bolingbrook is two shots behind. Medinah professional the long hitting Travis Johns is three shots off the pace with four time champion Illinois Golf Coach Mike Small five back at 3 under par. Our full recap of the last round will be posted after play is complete. No tee times for the delayed Round 3 have ye been announced the IPGA. THE 69TH ILLINOIS OPEN TEE’S OFF TODAY at the The Glen Club and Ravina Green Country Club,defending champion Patrick Flavin returns to defend his title and likely as a professional this time around. Patrick and Rory Spears, Director of Content and Creation for Golfersongolf.com on the first tee box at Ravina Green Country Club. 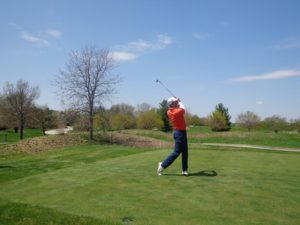 Patrick Flavin heads up one of the strongest fields in recent years in the 69th Illinois Open. the championship and it’s field of 268 players is spread out over two golf courses again this year. 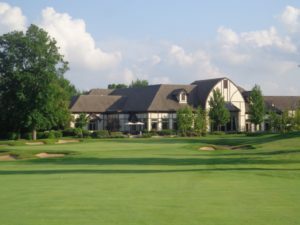 Players will alternate between the championships permanent home the Glen Club, home of the Illinois PGA section offices and the Illinois Golf Gall of Fame, and Ravina Green Country Club in Riverwoods. The players who make the cut after 36 holes will all play the Glen Club on Wednesday. The low 50 players and ties will survive to play on Wednesday. THE GLEN CLUB CLUBHOUSE and the Par 3, third hole at Ravina Green Country Club. 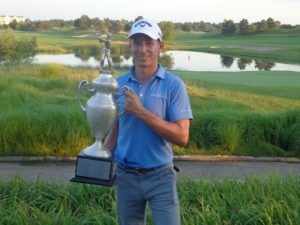 Click here to hear our interview with Patrick Flavin on returning as the defending champion at the 2018 Illinois Open. 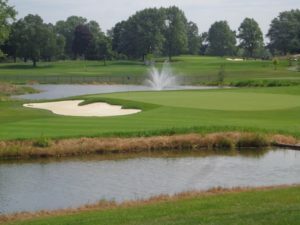 The field at this years Illinois Open might be one of the best in recent years. In addition to Flavin there are plenty of others who could compete for the title, and they include both amateurs and professionals. 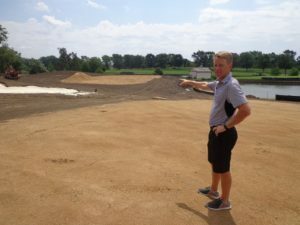 Mistwood Golf Club’s Director of Golf Andy Mickelson has had a great summer in competition, and other local professionals such as Vince India, Brian Bullington, Kyle Kochevar, and Michael Schachner should be in the mix. Top amateur players include Brendan O’Reilly, Trent Wallace, and Tommy Kuhl. Veteran IPGA section professionals such as Jim Billiter, Travis Johns, Matt Slowinski and Illinois Golf Coach Mike Small who has played solid in some PGA Champions Tour events, figure to be in the mix. Both the Glen Club and Ravina Green will play to a par of 72. Admission and parking are free, so come out and support golf and your favorite Illinois golfers as they compete for the title of Illinois Open Champion. Live scoring will be active at IPGA.com. THE GOG BLOG by RORY SPEARS, Director of Content and Creation. With Western Amateur Sweet 16 member Patrick Flavin, who opens his title defense at the Illinois Open tomorrow at Ravina Green CC. Follow Rory on Facebook, Linkedin and Twitter @GogBlogGuy. 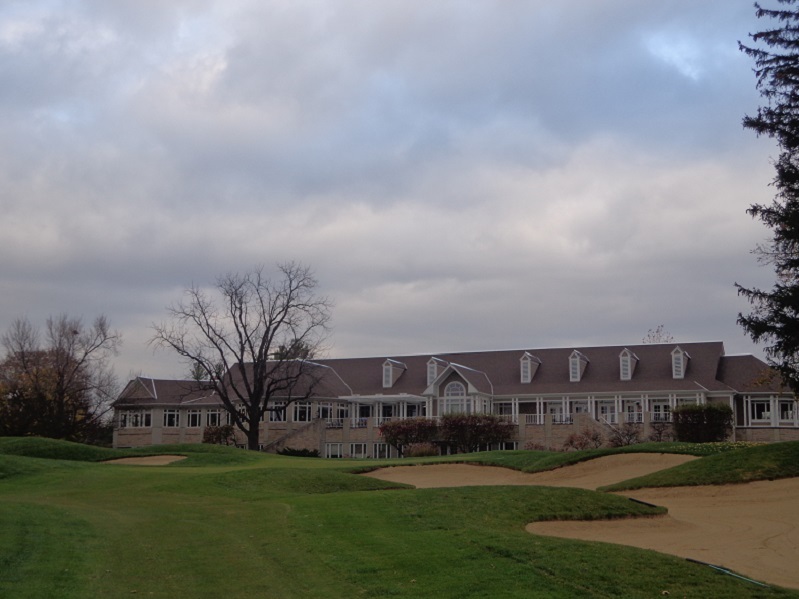 The Schaumburg Golf Club continues to make progress on it’s three phased renovation plan. 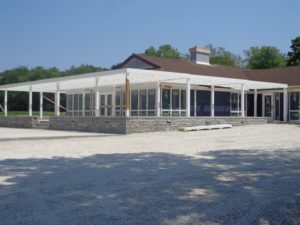 Prior to teeing off on this part of the plan the club made improvements to the clubhouse with the addition of simulators in the basement, that has allowed SGC to become a year-round golf facility. On bad weather days golf, golf lessons, club fittings, and league play can be accomplished. Once the renovation was moved outdoors, Phase One saw the improvements to the practice area’s that included an extension to the driving range, with the back end at 330 yards. The back end of the range has both a short game area, and private lesson area. The new putting green that golfers see as they enter the club,moved from being small to over 9,000 square feet. A perfect size when needed for outings or tournaments. The final part of the Phase One renovation was the redesign of the clubs Players Nine (holes 19-27) that are now complete. BIG 3 PARTNER Len Ziehm and yours truly check out the newly renovated Players 9 at the Schaumburg Golf Club (L-1st or 19th hole). Hole number 25 is the new Par 3 on the Players Nine. Holes 25 and 26 have been redesigned and flip-flopped, with a Par 3 for hole 25, and now a Par is Hole 26. 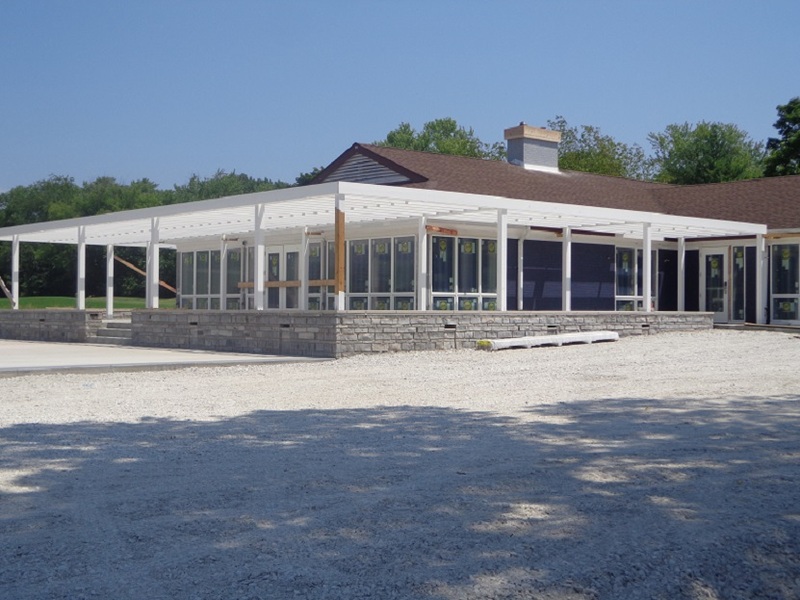 The renovation of the Schaumburg Golf Club is being done by Todd Quitno or Lohmann-Quitno designs. 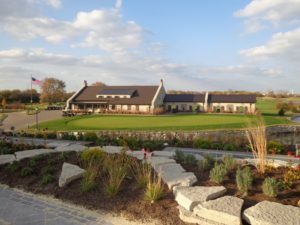 Senior partner Bob Lohmann did the renovation work on SGC back in the early 1990’s when work was last done on the golf course. 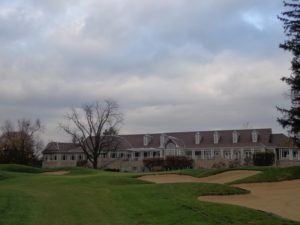 Click here to hear the interview with architect Todd Quitno, who is in charge of the renovation of the Schaumburg Golf Club. 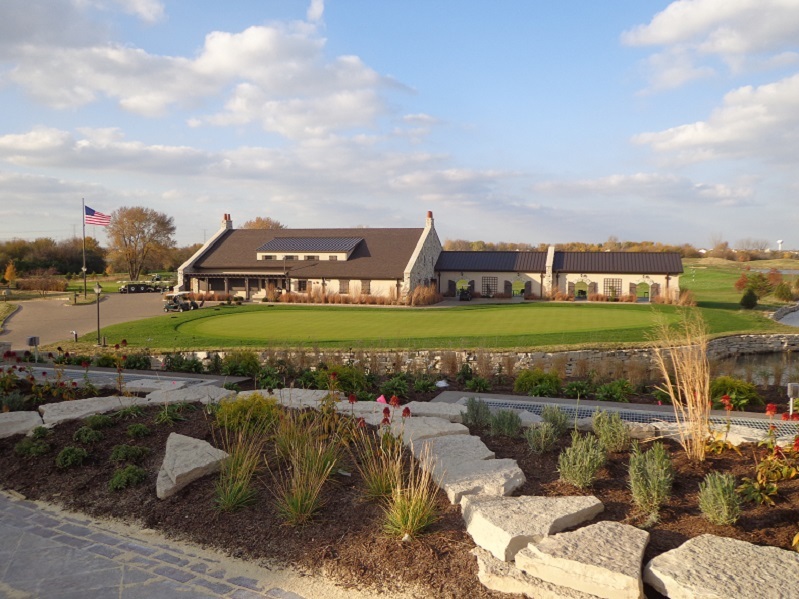 The early reviews of the Players Nine are nothing short of outstanding, with the reopening of the Players Nine, it’s safe to say the days of Golden Acres as the course was formerly called prior to the park district buying the course, are over. In fact the days of being called “Concrete Acres” are over as well. 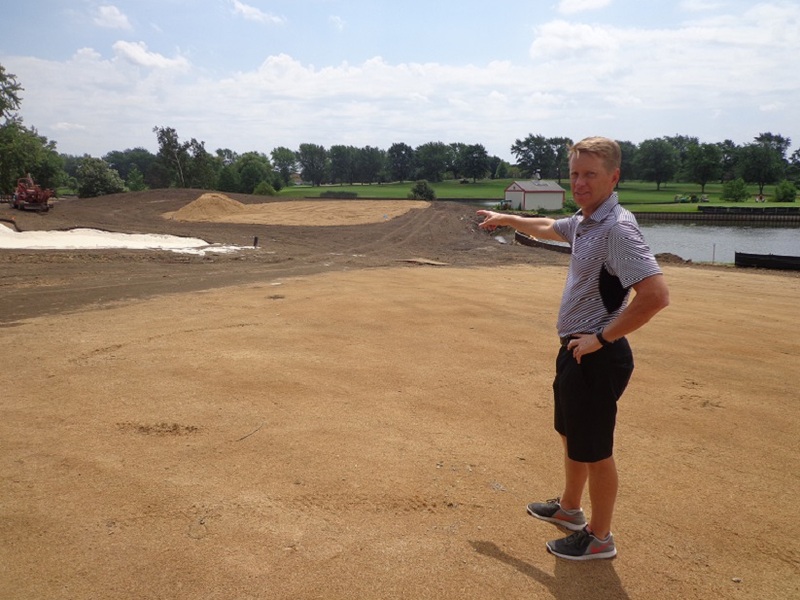 TODD QUITNO points out the changes during work on the first hole of Baer Nine around the green. The Opening hole on the Baer Nine from the first tee box (R). The Players nine reopened along with the putting green on June 30th, and on that day the Baer nine closed to begin work in Phase 2. The Baer Nine is expected to reopen about July 1st of 2019, and then the final nine will close. All 27 holes should be done from renovation and reopened around July 1st of 2020. 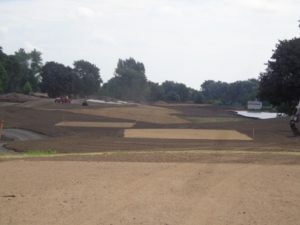 During the entire renovation process, Schaumburg Golf Club will have 18 holes open for play, along with all of the practice facilities. The clubs second putting green behind the clubhouse and near the first tee of the Baer Nine, will be redone as well. For tee times and more information the Schuamburg Golf Club please visit Schaumburggolf.com or call the club which is also home to Chandlers Chop House, at (847)-885-9000 and hit #1 for the pro shop. Located at 401 N. Roselle Road just 5 minutes away from Woodfield Mall. THE GOG BLOG by RORY SPEARS, Director of Content and Creation, follow Rory on Twitter @GogBlogGuy, Facebook, Linkedin and Instagram. Reporting from Northfield. 2018 Western Amateur champion Cole Hammer with the George R. Thorne champion’s trophy and the Cameron Eddy medalist trophy. Hammer was co-medalist in the stroke play qualifying and won the championship match Saturday, Aug. 4, 1 up over Davis Riley. Photo Courtesy of WGA. UNIVERSITY OF TEXAS bound 18 year old Freshman Cole Hammer wins the 116th Western Amateur over University of Alabama Sr. Davis Riley by a score of 1 UP. The match really wasn’t that close for the first 11 holes, and then things changed, and in the end Hammer was just holding off a charging Riley to hold on and win. Hammer jumped out to take a lead on the third hole, with a birdie to go 1 UP. On holes six and seven a birdie and par upped his lead to 3 UP. Hammer then won the ninth hole after Riley’s drive found the rough, and it was Hammer by 4 at the turn. After both players made par on ten, the match changed on the 11th hole. Both players ended up backing off of putts as noise filled the area around the green from the club’s nearby swimming pool. When Hammer missed a comeback putt for par, and Riley made a three footer for his par, the momentum changed and Riley’s comeback attempt was on. After almost driving the 12th green, a short chip by Riley left him a six foot birdie and quickly the lead was down to 2 UP. Click here to hear interviews with the two championship match finalists, winner Cole Hammer and runner-up Davis Riley. Both players made clutch birdie putts on the par 5, 13th hole, and then Riley hit his second shot over the green on the 14th hole. Hammer two-putted for par and the lead was 3 Up with four to play. But Riley wasn’t done yet. His tee shot on the par 3, 15th ended up ten feet from the cup, and when that birdie putt fell Hammer had only a 2 UP lead. Riley then one-putted for birdie on the par 5, 16th hole, and reduced Hammer’s lead to 1 UP with two holes to play. Playing the 17th hole for the first time since stroke play on Thursday, Riley landed his tee shot long and the ball came back down the slope and leaving him near 15 feet for birdie. Hammer hit his tee shot in long and the ball came back down the ridge only about two feet, and he was left with about 18 feet for his birdie. Cole Hammer hits his third shot on the Par 5, 16th hole, and Davis Riley (R) hits his opening tee shot in the championship match,played in 94 degree heat at Sunset Ridge Country Club. With both players facing slippery downhill putts, they were both careful with how aggressive they could be, and both had putts just slip by the edge of the cup. With Hammer still 1 UP, the players headed for the Par 4, 18th that was set up not only short, but the players had a tailwind that had increased on the back nine. Riley went first and his approach shot to a back middle pin rolled just off the back of the green and near the collar. Hammer then hit and saw his ball roll off the back of the green and it stopped on the fringe cut. Hammer putted first and his putt slid by the edge of the cup, only to see Riley then hit the same putt from almost two feet shorter only to have it run past the cup about two feet. Both par putts were conceded and Hammer had won the Western Amateur. One of the highlights for Hammer, was having his mom Allison caddie for him. Allison is a 4-handicapper who has won multiple club championships at the families club in Houston Texas. Allison Hammer said she is bot on the bag in two weeks for U.S. Amateur as Cole has hired a local caddie. Hammer with two match play matches running 20 holes, had played 11 more holes than Riley in the match play part of the format. But running on adrenaline Hammer said he didn’t feel tired. But after the match said he was ready for bed. Riley said he spoke with Alabama alum Justin Thomas on Friday, but even that phone call with both players wishing each other good luck on the weekend was not enough for Riley. Both players will compete in the U.S. 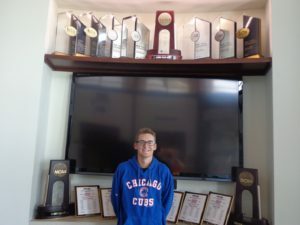 Amateur at Pebble Beach, and Hammer says he will return to defend his title in the 2019 Western Amateur at the Point O’Woods Golf Club in Benton Harbor Michigan. In the morning semi-finals Hammer defeated Brandon Wu in 20 holes, and Riley defeated Tyler Strafaci 4&2. 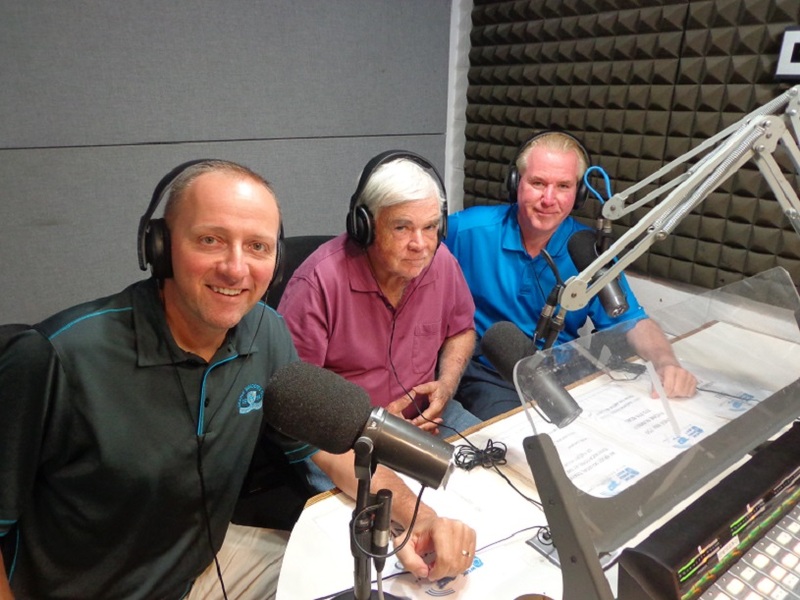 GOLFERS ON GOLF RADIO AM 750 WNDZ Saturday mornings from 10-11 Am, is Chicago’s Favorite Foursome, Ed Stevenson, Bill Berger and Rory Spears, with variety of special guest hosts from the golf industry. 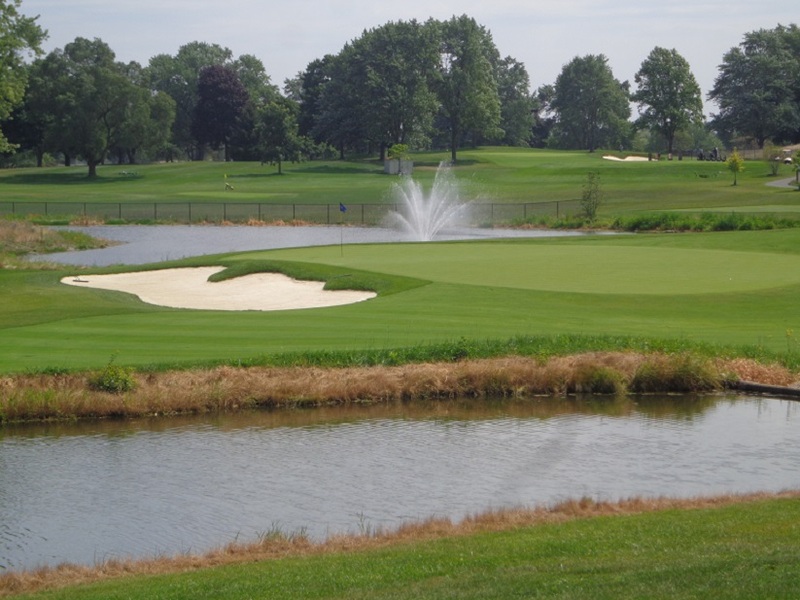 This week’s guest host is Illinois PGA Executive Director Carrie Williams, in advance of this weeks Illinois Open at the Glen Club with the second course being Ravina Green Country Club. Defending Champion Patrick Flavin returns to defend his title, after a run to the Sweet 16 at the Western Amateur Championship at Sunset Ridge. Golfers on Golf Radio is presented by the French Lick Resort, of French Lick Indiana, visit Frenchlick.com. 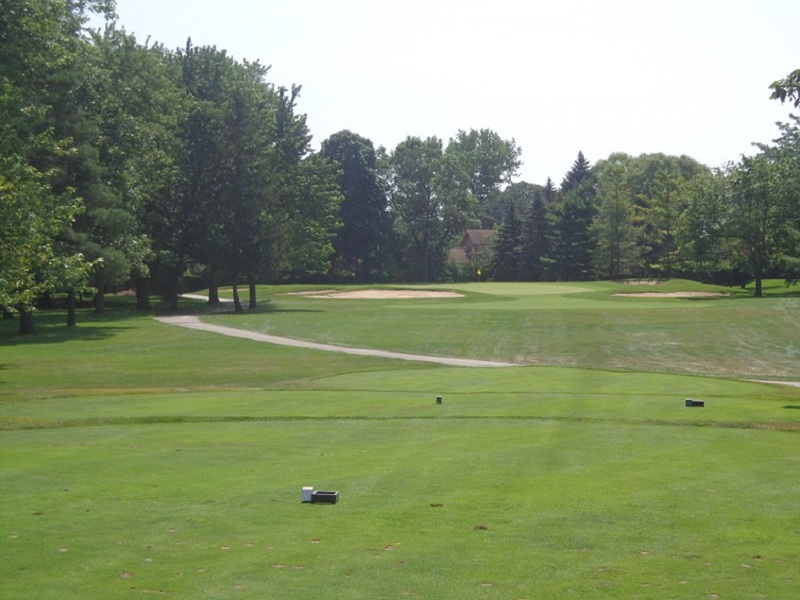 This week the Illinois Open returns to the Glen Club for all three rounds, and Ravina Green Country Club located in Riverwoods enters as the second course, for play in Rounds 1&2. After the cut is made after Round 2, final round play will be only at the Glen Club. 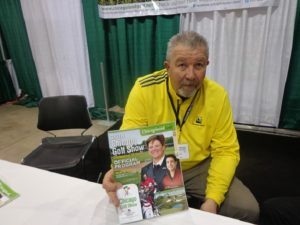 Carrie will talk about the expanded field and some of what’s new at the Illinois PGA Section, in the week where the PGA of America celebrates it’s 100th PGA Championship at the Bellerive Country Club in St. Louis. 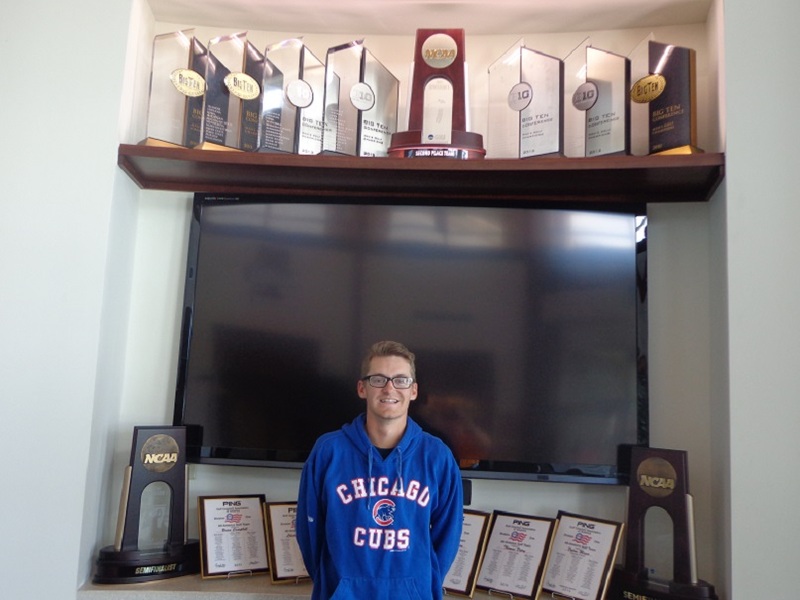 Ethan Roush the Head Golf Professional at The Glen Club who is playing in the Illinois Open will join the show live from the club. AM 750 WNDZ 10-11 Am, join us. We will have updates on the Western Amateur, and hear from defending Champion Patrick Flavin during the show. 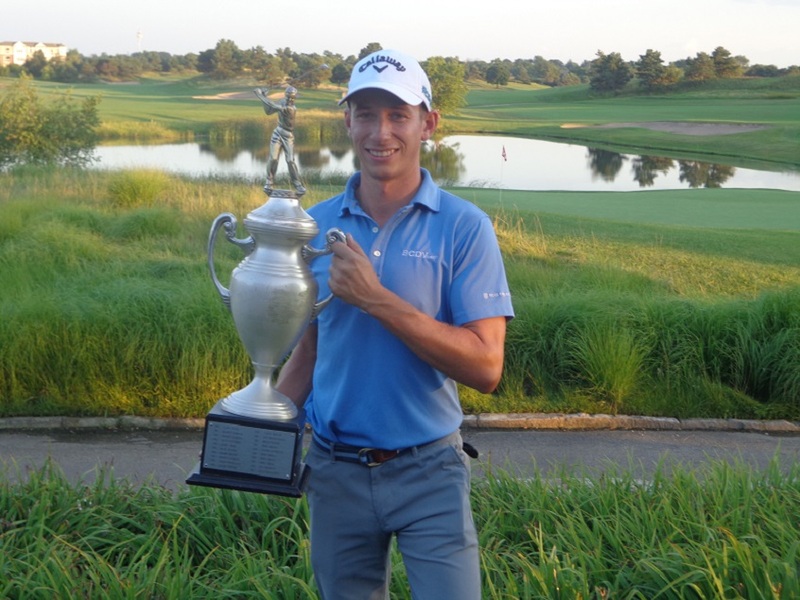 Our Western Amateur Championship recap will be posted here on Saturday night, with stories from the Illinois Open on Monday-Tuesday and Wednesday. With a preview here tomorrow (Sunday).